As per this study, the Global Aerostructures Market was valued USD 56.5 BN (by revenue) in 2017 and is anticipated to reach USD 86.3 BN by 2024 with a CAGR of 6%. Aerostructure refers to the separately manufactured component of the aircraft’s airframe. These are the essential components that aid aircraft to fly and withstand in changing aerodynamic forces. Aerostructures are specially designed structures to withstand extreme weather condition and structural fatigue caused due to extreme loading cycle or bird strikes. Different types of materials such as composites, metals, alloys, and superalloys are used as aerostructures depending upon their properties and performance. Aerostructures majorly include fuselage, empennage, wings, nose, flight control surfaces, etc. Modern aerostructures are lightweight, performance-driven, thin-walled constructions made up of multifunctional materials. 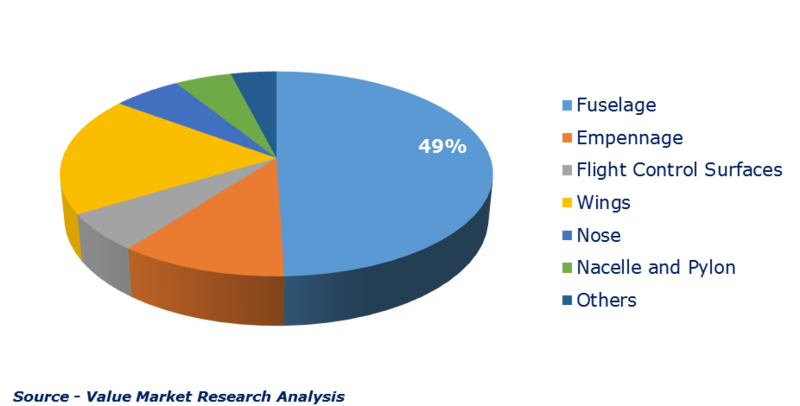 The aerostructure market is primarily driven by increased deliveries of commercial aircraft across the globe. With the increase in passenger mobility over the past few years, the commercial aviation industry is witnessing significant growth in the deployment rate of commercial aircraft, which is strongly driving and supporting the growth of the global aerostructure market. North America is anticipated to contribute the largest market share in the global aerostructure market due to the presence of leading aircraft manufacturers in this region, such as Boeing, Bombardier, Lockheed Martin, etc. However, problems associated with composite materials such are material recycling is anticipated to restrain the growth of the aerostructure market during the forecast period. This detailed market study is centered on the data obtained from multiple sources and is analyzed using numerous tools including porter’s five forces analysis, market attractiveness analysis and value chain analysis. These tools are employed to gain insights of the potential value of the market facilitating the business strategists with the latest growth opportunities. Additionally, these tools also provide a detailed analysis of each application/product segment in the global market of aerostructures. The broad aerostructures market has been sub-grouped into composite, material, end-use and platform. The report studies these subsets with respect to the geographical segmentation. The strategists can gain a detailed insight and devise appropriate strategies to target specific market. This detail will lead to a focused approach leading to identification of better opportunities. Furthermore, the report comprises of the geographical segmentation which mainly focuses on current and forecast demand for aerostructures in North America, Europe, Asia Pacific, Latin America, and Middle East & Africa. The report further focuses on demand for individual application segments in all the regions. The report also covers detailed competitive landscape including company profiles of key players operating in the global market. The key players in the aerostructures market include Aar Corp., Bombardier Inc., Cyient Ltd., Elbit Systems Ltd., GKN Aerospace, Leonardo S.P.A., Ruag Holding AG, Saab AB, Spirit Aerosystems, Inc., Stelia Aerospace Group, Triumph Group, Inc. and UTC Aerospace Systems. An in-depth view of the competitive outlook includes future capacities, key mergers & acquisitions, financial overview, partnerships, collaborations, new product launches, new product developments and other developments with information in terms of H.Q.